Jess has to learn how to stop being everything for everyone all the time. Because if she doesn’t, she’s going to ultimately be the cause of her own demise in the end. 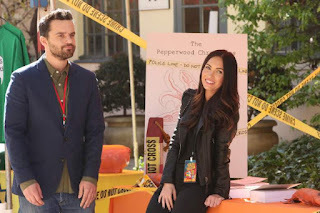 Elsewhere in the episode, we get two really fun stories to prop up Jess’ main arc -- one with Schmidt and Cece (who help Jess realize that she’s the glue holding Nick and Reagan together) who attempt to make their new home safe, and one with Winston and Aly who clean out her storage unit and swap secrets. Cece tells the line above to Jess when the woman realizes that she’s the one thing keeping Nick and Reagan together. (I love the montage of moments in which Jess — and the audience — realize exactly how many times she’s pushes Nick and Reagan together.) Jess is so accustomed to being the “good friend,” that she often doesn’t realize how to step away when being a friend is actually hurting her, emotionally. After vehemently denying it for a chunk of the episode, Jess comes to realize that she’s actually acting as Nick’s girlfriend rather than his good friend. She’s putting herself in a position to get hurt because she’s NOT his girlfriend. And even though it goes against everything in her nature to not be there for someone else, Jess recognizes that being there on an emotionally vulnerable level for Nick is not healthy. Reagan needs to be the one to step up and fill that role, which she is unable to do. And why, you ask? Because Jess has been stepping in and playing the role of Regan’s girlfriend too. Reagan and Jess confide in one another and rely on one another too much when dealing with Nick. Reagan doesn’t know Nick as well as Jess does, so the former relies on our favorite people-pleasing enabler to help her out with her relationship woes. There’s no malice though with Nick and Reagan relying on Jess — they’re not purposefully exploiting her emotions or trying to hurt her. But Jess knows that she can’t do this anymore: she can’t constantly be there for Nick and do all of the girlfriend things while someone else reaps the benefits (see what a nice parallel to “Fluffer” this actually makes?). It will hurt too much — it already is. One thing I can say about New Girl is that they’re fans of the slow burn. And while they occasionally misstep, they writers are not looking to make quick fixes to the relationships that have fallen apart. Nick and Jess will always care about one another — that much is evident. But the way the show has been building Nick’s feelings and now is building Jess’ is so important. We’re finally seeing both sides of their relationship. And we’re finally understanding why it hurts Jess so much to be around Nick. I love that the directors have been giving us little glimpses into her pining — watching Nick and Reagan dance at Schmidt and Cece’s wedding or seeing Reagan pick lint off Nick’s jacket. It’s going to make it so much more satisfying when the two get together because now, finally, I think Jess is ready to fight for Nick. But that doesn’t mean she puts her relationship first and her feelings second. The end of “Socalyalcon VI” sees Jess doing something impulsive — leave Nick and Regan at the book convention and hop a plane to Portland without telling anyone other than Cece what she’s doing. Jess is like me: a meticulous planner who takes very careful, small steps in her life and relationships. But every Jess needs a Cece — someone who will tell her and people like her that it’s okay to distance yourself from other people if it hurts too much. I’m really glad that Nick is aware of how Jess might be feeling, and that Jess is self-aware enough to know that being Nick and Regan’s emotional support systems isn’t healthy for her (or them, honestly). Our tiny little Winston/Aly story this episode involved Aly keeping her storage unit secret from Winston. When she finally unveils it and her secret—that she was a Japanese game show winner who owns a lot of random swag from those days — Winston isn’t horrified; he’s delighted. The two nearly miss work because they spend so much time playing with all of the spoils of Aly’s past. But it does bring up something in Winston: he doesn’t really have any secrets from Aly, while he’s still learning things about her past. It seems to bother him a little bit that Aly knows everything about him. That is, until he confesses something to her — he’s lied to all the women he's ever said he loved, because he didn’t know what real love was until he met her. Awwwwww. Speaking of love, Schmidt and Cece are finally all moved into their new home and are also realizing that being homeowners is very different from being renters. The issue this week? The fact that their home has more points of entry than they realize. It’s played for laughs, as Jess and Nick (and then Jess by herself) manage to break into the home. I just love seeing Schmidt and Cece do domestic things together and configuring a home security system was one of those things. “Socalyalcon VI” provides a really nice jumping point for the last part of the season. With only a few episodes left, will Jess actually tell Nick how she feels? We’ll have to wait and see! “ARE YOU THE CRIMINALS? FROM THE STATISTICS?” Why hasn’t Max Greenfield been given all of the awards? I don’t know why, but the idea of Aly being a Japanese game show winner is fantastic. “Why do they both need me so much all of the sudden?” “ALL OF THE SUDDEN? !” And then the show flashes to a montage of moments where Jess helped Nick and Reagan communicate with one another. I love the montage revealing how much Nick and Reagen have depended on Jess and that it involved actual moments from past episodes. Great work on the writers' part.